Applications include: RF, microwave, millimeter wave applications, network infrastructure, radar and communications systems, medical instruments, and other electronic equipment. We have an extensive family of narrow-band and wide-band low noise amplifiers and ultra low noise amplifiers. 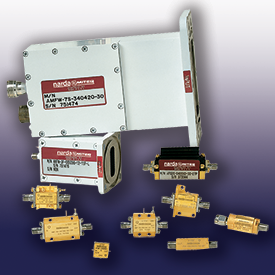 Designs range in frequency from 1 kHz to 67 GHz. We offer a large line of low noise amplifier products. Several package types are available to accommodate a variety of applications. that amplifies a very low-power signal without significantly degrading its signal-to-noise ratio. By design, amplifiers increase the power of both the signal and the noise present at its input. LNAs are specifically designed to minimize additional noise. Although LNAs are primarily concerned with weak signals that are just above the noise floor, they must also consider the presence of larger signals that cause intermodulation distortion. 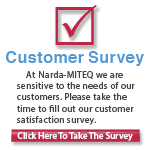 L3 Narda-MITEQ's catalog of Low Noise Amplifiers offers thousands of models. Below is a link to the full catalog listing of our Low Noise Amplifiers. Furthermore, the search form can also help you select the right model for your application. For further information, pricing, and delivery please contact Component Sales. High Power Amplifiers, Logarithmic Amplifiers and Limiting Amplifiers, among many other specialty amplifier types. See the sub-categories, or use the Products menu in the top navigation to see all Amplifiers. For over 60 years, L3 Narda-MITEQ, the pioneers in Amplifier development, have been customizing to our customers specific requirements. This can include new design efforts, modifications to existing designs for performance and mechanical needs, as well as additional testing and environmental screening. 3-Year Warranty and RoHS Compliant components.